Why Research All of the Children? 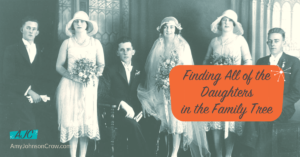 When we research all of the children in the family, it gives us a more complete view of that family and it helps put the ancestor in context. 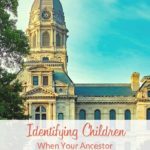 There's also the added benefit of when you're researching the other children, you might come up with some clues for things that you can research about your direct ancestor. It's definitely worth the time and effort to research the whole family. However, finding females can be a bit of a challenge. First, we have the problem of so many records were created by and for men; females aren't included as often in the records, especially the further back you go. We also have the challenge that in many western cultures that females change their surname every time they get married. That means that there are times when you don't know what name you should be looking for. Since so many records were created by and for men, let's use that to our advantage and explore the records about the father in the family. Another probate document to look for is the final distribution. 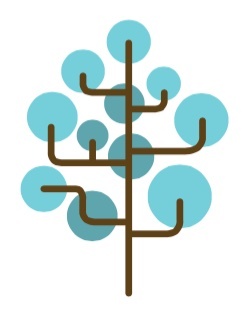 A final distribution will list all of the people who have inherited from the estate and how much they inherited. The final distribution is going to be created whether or not the person had a will. What's important about these final distributions is that it lists the females with the name they were going by at the time; if daughters are are getting something from the estate, they are listed with their married names. You'll usually find statements of final distribution together in a probate packet or probate case file depending on how the probate papers are arranged in that particular county. If the father died without a will and he owned land, his land and the rest of the estate was divided up according to the laws of inheritance in place at that time. In many places, the administrator of the estate had to start a court proceeding called a partition suit and essentially it got all of the heirs to sign off on selling the land. What's wonderful about these partition suits is that they include all of the heirs of the estate. If the daughters were married, they would be listed with their married names. Another way that we can approach this problem is by researching the other known children. Look for things like their obituaries. You never know who's going to be listed in an obituary. Here's an obituary that I recently found in the South Kentuckian, which was published in Hopkinsville, Kentucky. 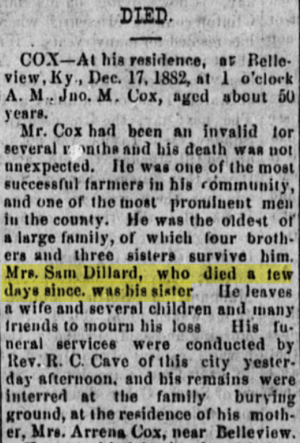 Although it doesn't give the first name of John Cox's sister, we now know that one of the Cox daughters (John's sister) married Sam Dillard. Also look for the siblings' listings in county histories. (Hopkinsville, KY) South Kentuckian, 19 December 1882, p. 2. Image courtesy Chronicling America. How can we use all of those wonderful databases if we don't know what name we're looking for? That's when I like to employ a search strategy of going into one specific database and, if I can, looking by the name of the parents and leaving the person that I'm looking for completely blank. For example, I wanted to find the death certificates of the children of Mannon Pettit and his wife Susan Cain of Pennsylvania. 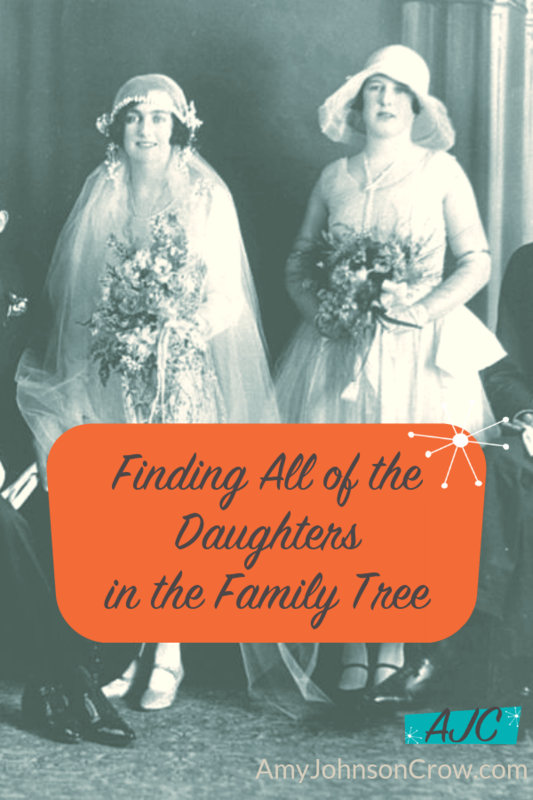 I knew the first names of many of the daughters based on the census, but I didn't know all of their married names, so how was I going to search for them (as well as find any children I hadn't yet identified)? I decided to use my nameless search strategy. 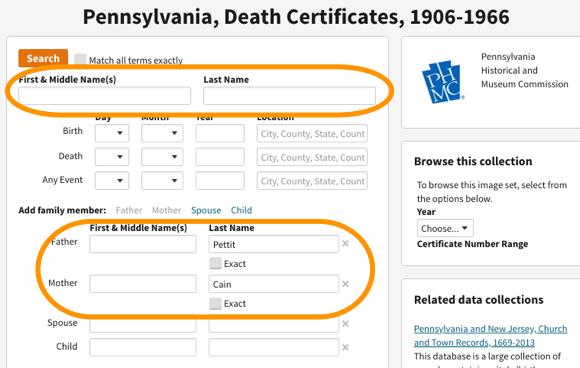 In Ancestry's collection, "Pennsylvania, Death Certificates, 1906-1966," I left the name of the deceased blank and searched with father's last name of Pettit and mother's last name of Cain. I found two of the married daughters using this search strategy. Seeing the other information on the death certificate, including when and where they were born, I could verify that these were members of the family. Note: The challenge with death certificates is that the information is only as accurate and complete as the knowledge of the informant. Because of this, I usually do two searches — once with the father's surname and mother's maiden name (like above) and a second search using the father's surname and the mother's first name. This will help turn up records where they didn't know the mother's maiden name. 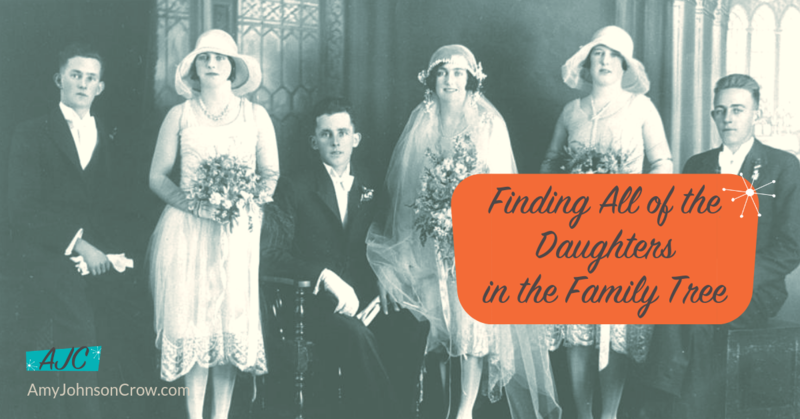 It's important in our research to take a look beyond just our direct ancestor and research the other family members. 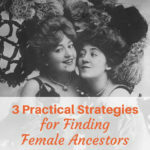 Even though it can be challenging to find the females in the family tree, we have some good search strategies that we can use so that we can identify them. 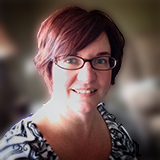 This entry was posted in Podcast, tips and tricks and tagged females, Generations Cafe by Amy Johnson Crow. Bookmark the permalink. Thank you for this podcast! 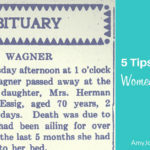 I never thought about using wills/probate to find daughters’ married names or looking through specific death certificates to find children of a couple. This tips will come in handy!! Love your nameless search strategy!! I definitely have a few family members, female collaterals, with very few clues. Merci! Great advice! I have a will that names all 4 daughters, but only by first names. Now I can go back to the courthouse looking for the Final Distribution..
What great advice in ways to search for daughters with/with out names in wills, etc. Thanks Amy these are really helpful strategies. thank you that was very helpful and will re listen to it thank you . I love your nameless search strategy. It had never occurred to me to search this way. Thanks for the tips, Amy! I deeply appreciate this generation Podcast#2 I have too many women whose surname is a pair of question marks; this was helpful and encouraging; !